WASHINGTON, DC, March 8, 2012 (ENS) – Visiting the Daimler truck manufacturing plant in Mount Holly, North Carolina Wednesday, President Barack Obama announced a new $1 billion set of incentives to help consumers and businesses purchase new advanced trucks and cars. President Obama announced a new National Community Deployment Challenge to catalyze up to 10 to 15 model communities to invest in the necessary infrastructure, remove the regulatory barriers, and create the local incentives to support deployment of advanced vehicles at critical mass. This proposal is fuel neutral, allowing the selected communities to determine if electrification, natural gas, or other alternative fuels would be the best fit for them. These model communities would serve as “real-world laboratories,” leveraging limited federal resources to develop different models to deploy advanced vehicles at scale, the White House said in a statement. The program also would support the development of up to five regional liquefied natural gas (LNG) corridors where alternative fuel trucks can transport goods without using a drop of oil. To make electric vehicles more affordable, the President proposes to increase the tax credit from the current $7,500, making it scalable up to $10,000. Obama would expand eligibility for the tax credit to a broader range of advanced vehicle technologies and remove the cap on the number of vehicles per manufacturer eligible for the credit. As part of his proposal, President Obama would reform the EV tax credit to make it available at the point-of-sale by making it transferable to the dealer or financier, allowing consumers to benefit on the day they purchase an electric vehicle rather than when they file their taxes. Daimler Trucks North America is a partner in the Energy Department’s SuperTruck initiative to increase the fuel efficiency of long haul trucks, or 18-wheelers, by 50 percent by 2015. While long-haul trucks are only four percent of U.S. on-road vehicles, they account for almost 20 percent of U.S. on-road fuel consumption, consuming more than 30 billion gallons of gasoline a year. To increase fuel efficiency, companies like Daimler are developing and improving vehicle technologies in engine efficiency, aerodynamics, waste heat recovery and hybridization. 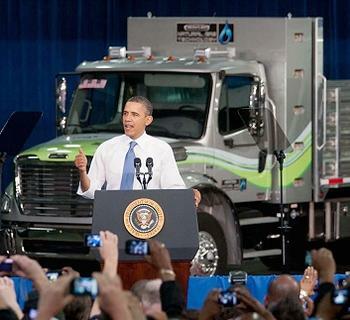 President Obama also proposed a new tax incentive for commercial trucks over the next five years that would provide a tax credit for 50 percent of the incremental cost of a dedicated alternative-fuel truck, including trucks powered by natural gas or electricity. This incentive, paired with support through programs like the Energy Department’s National Clean Fleets Partnership, will not only drive down domestic demand for oil, but also drive up demand for the sorts of vehicles built at the Mt. Holly truck manufacturing plant, he said. The President also announced a new research challenge called EV Everywhere, that invests in breakthrough electric vehicle technologies. This national effort, the second in a series of Clean Energy Grand Challenges designed by the Department of Energy, will gather America’s best and brightest scientists, engineers, and businesses to work together to solve energy technology challenges. EV Everywhere will invest in breakthrough research and development for advanced batteries, electric drivetrain technologies, lightweight vehicle structures, and fast charging technology. The program will enable U.S. companies to produce electric vehicles at lower cost, with an improved vehicle range and an increased fast-charging ability, so average American families will be able to own and drive an electric vehicle as affordable and convenient as today’s gasoline-powered vehicles. The savings from using lower-cost electricity instead of gasoline is estimated at roughly $100 per month for the average driver. The President’s Fiscal Year 2013 Budget includes $650 million to advance vehicle and battery technologies at the U.S. Energy Department, including investments that support the EV Everywhere challenge.